Hi loves! 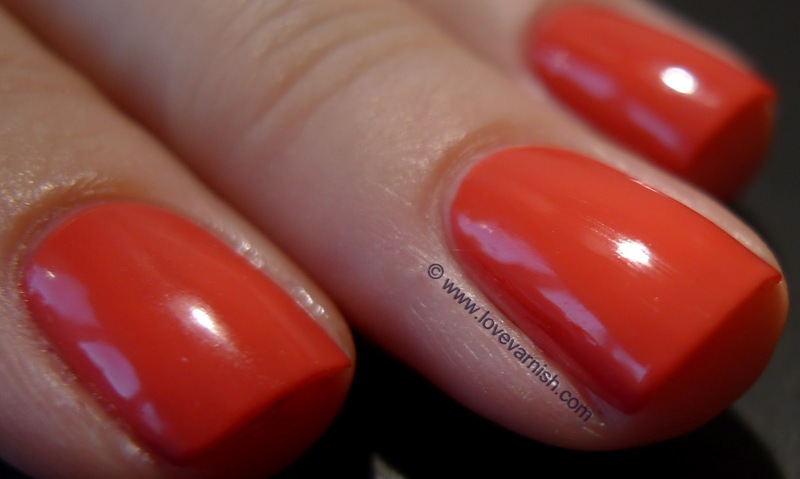 Today I have a stunning coral polish to show you (bet you didn't see that coming considering the post title, right?). It's Coralicious made by Rimmel and it's one of those creme jelly hybrids, a crelly. I used 3 coats for this and even though I didn't have visible nail line anymore, though it seemed like I did in some lighting, the dark spot in the second picture shows it isn't as opaque as it appaers to be. I wore a dark blue mani before this and apparently some of it remained stuck to my nail, showing through 3 coats of this gorgeous coral color! Application wasn't super easy. This bottle contains the so called Xpress brush which is pretty wide and thick. Also, because of the jelly nature it tends to be a bit gloopy. Not thick or thin but unpredictable in how it flows on the nail I guess. Luckily the color makes up for it and this is a bright bright color! I am glad this isn't a flat creme because now it has squishyness that makes it even better. Pretty! Makes me think of Austin Powers. I can already hear him say 'CORALICIOUS BABY'. That's cute! What's your fav' coral nowadays? Well thanks for putting THAT in my head ;).